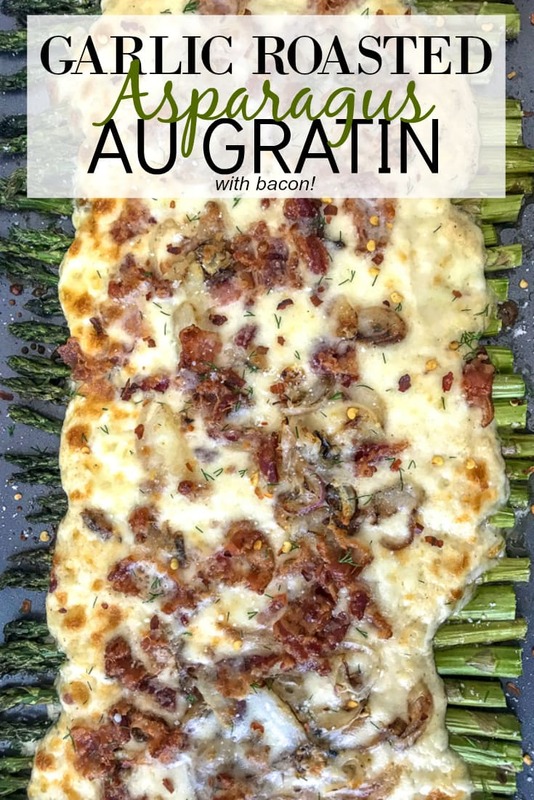 Garlic Roasted Asparagus Au Gratin – this is the ultimate au gratin recipe if there ever was one! 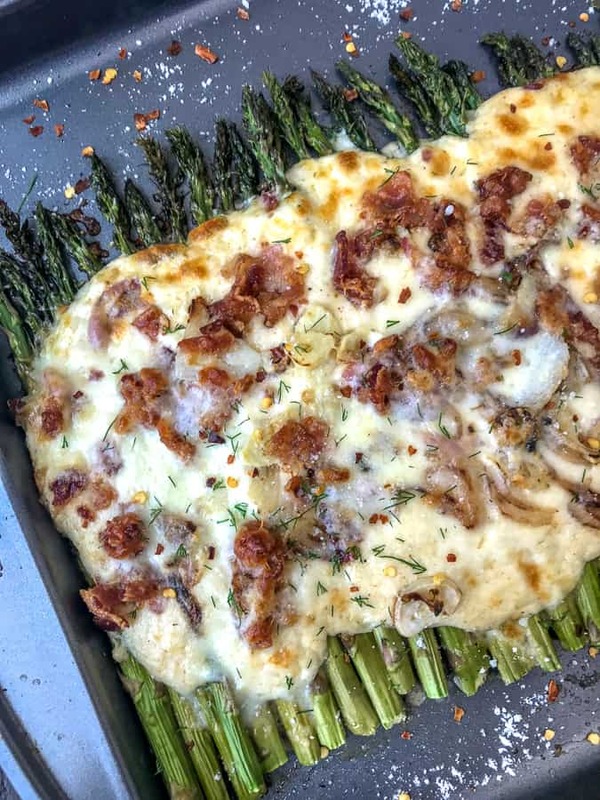 Oven-roasted asparagus topped with sautéed garlic and shallots, bacon, and the creamiest three-cheese sauce! Baked to perfection and incredibly delicious! Perfect as a side dish for the holidays or any occasion. You and your family are going to love it! 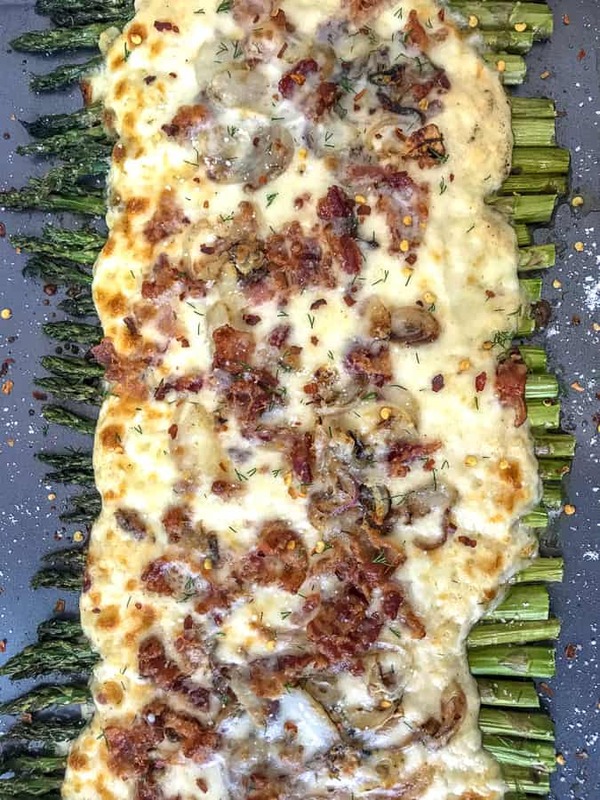 GARLIC ROASTED ASPARAGUS AU GRATIN – with bacon! Because everything is better with bacon. Am I right? It goes with anything you can think of and with any meal: breakfast, lunch, dinner and apparently – dessert? I have yet to try a donut topped with bacon, chocolate covered bacon, or anything sweet with bacon. Am I missing out on these sweet and savory treats? I must be. It seems to be all the rage these days! I’m not sure I can hop on that bandwagon, though. I’m apprehensive. Whether or not you’re a fan of bacon, this dish is incredible. Heck, I feel that word is understating how truly delicious this is. Perhaps I am biased, but I think not. My taste buds don’t lie! Don’t care for bacon? You can omit it entirely and this dish will still be amazing. Or you can use ham (any holiday leftovers?) or pruscitto. As a blogger, you stay so busy prepping, cooking, setting up, playing with your food (to make it look pretty), photographing, etc. You hardly get the time to sit and enjoy a recipe you create because you’re moving on to the next recipe that you have lined up. Or simply to clean up your mess of a kitchen. But when you create a dish that you sample or nibble at and find yourself nibbling more and more as soon as it’s finished – you’re anxious to get it posted and sent out to the world to try. Call it my pride, but I put a lot of passion into what I do. Not every dish comes out the way that you want it to, sometimes they don’t photograph well, or you end up having a mess of a kitchen with nothing to show for your work because you’ve dropped a dish on the floor. This dish came out perfectly – the second go-round. It photographed for me beautifully. Didn’t end up on the floor! HA! It is absolutely and sinfully delicious!! This side dish is so easy to make – you’re going to love it. Full recipe and directions are listed below in the recipe card with a button to print the recipe off! First, line the asparagus up in a row on a baking sheet. Drizzle with 2 tablespoons of olive oil and season with salt and pepper, to taste. Roast for 10-12 minutes in a preheated oven at 400 degrees F.
While the asparagus is roasting, melt the butter in a large nonstick pan. Once melted, whisk in the flour, half and half, cream cheese, and parmesan cheese. Season and whisk until the sauce thickens. 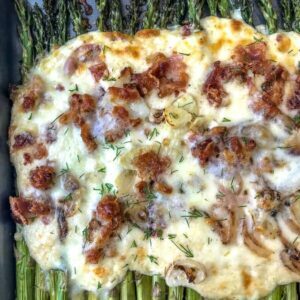 Pour the sauce over the asparagus, top with sautéed garlic and shallots, bacon, and freshly shredded mozzarella cheese. Roast for an additional 10 minutes, or until the cheese has melted and started to bubble. You end up with perfectly roasted, tender asparagus topped with the creamiest three-cheese sauce imaginable. Guaranteed to be a hit on your dinner table! Roasted Balsamic Brussels Sprouts – super simple side dish that is sure to be a hit at your next party or family gathering! Comes together in no time and is full of flavor. You won’t make brussel’s sprouts any other way after trying this. Easy Tender Instant Pot Turkey Breast – looking to make your life easier this holiday season? Try making your turkey in the Instant Pot! So easy you will be delighted! Comes together from start to finish in approximately 1 hour – including gravy! Roasted Red Pepper Rigatoni – one of my new favorites! This pasta dish is the ultimate comfort and comes together in 20 minutes with only a handful of ingredients. Serve this with those skillet rolls or your favorite garlic bread. YUM!! Cheesy Broccoli Ham Casserole – have any leftover ham from the holidays? Try this recipe! Broccoli and ham tossed in a homemade creamy, cheese sauce that is topped with a crispy, buttery breadcrumb topping. So much flavor! 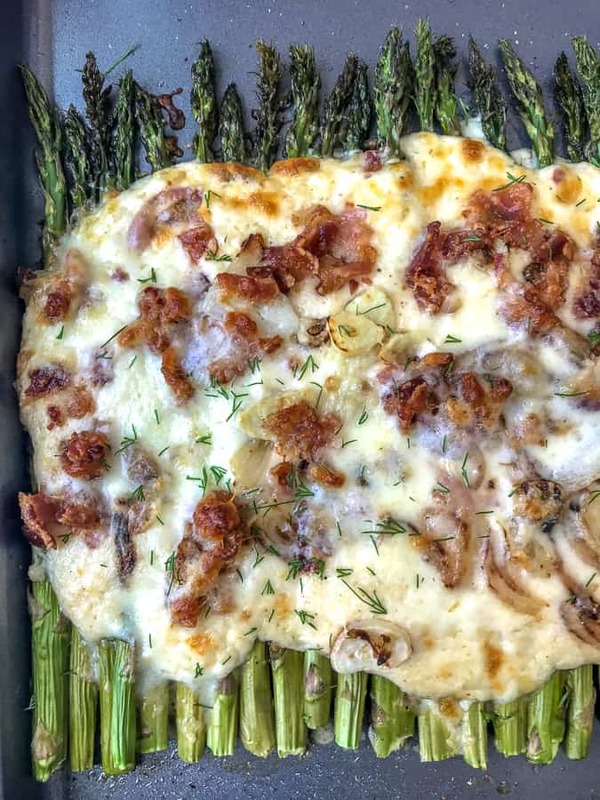 Oven-roasted asparagus topped with garlic, shallots, bacon, and the creamiest three-cheese sauce! Very easy to make, incredibly delicious and the perfect side dish for any occasion. Preheat oven to 400 degrees F. Trim asparagus ends and line them up in a single layer on a baking sheet. Drizzle 2 tablespoons of olive oil over the asparagus and season with salt and pepper, to taste. Roast the asparagus, uncovered, for 10-12 minutes or until they are fork-tender. While the asparagus is roasting, place a large nonstick pan over medium heat and cook the bacon until it reaches desired doneness. Remove to a plate with paper towels to keep warm and soak up excess grease. Pour the remaining bacon grease out from the pan, leaving just enough to saute the onions and garlic, and return it to the burner. Add the sliced shallots and garlic. Sauté 2-3 minutes and remove to the same plate as the bacon or new plate. Place butter into the same pan over medium heat. Once melted, add the flour and whisk until no longer clumpy. Pour in the half-and-half, whisking for 1 minute, or until it starts to thicken. Add the cream cheese and parmesan cheese. Stir until the cheeses melt. Add the remaining seasonings, stirring to fully incorporate. Taste test to adjust seasonings as preferred. SEE NOTES BELOW ON SAUCE TEXTURE. Pour the sauce down the center of the asparagus. 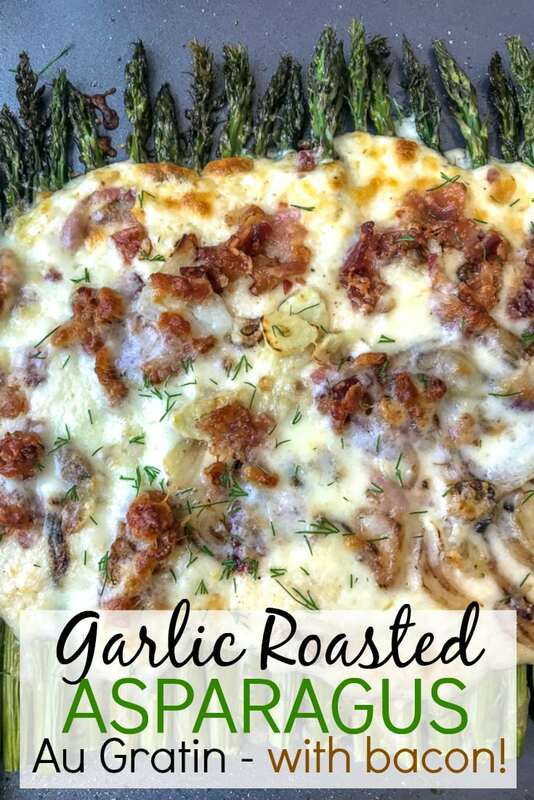 Top with bacon, shallots, and garlic, followed by shredded mozzarella cheese. Roast for an additional 8-10 minutes or until the cheese has melted and started to bubble. If you like your cheese to have a slightly crispy, brown bubble coating - turn the oven to broil on LOW for 2-3 minutes. Be sure to watch to prevent burning! Remove, garnish with red pepper flakes, parsley, and dill weed - if desired, and serve immediately. GARLIC LOVERS: This recipe is for garlic-lovers. If you're not a fan, either omit the sautéed garlic topping or omit adding the garlic powder to the cheese sauce. BACON: If you're not a fan of bacon, omit or replace with ham or prosciutto. SAUCE: If the sauce starts to thicken too much, add a splash more of half-and-half. If it's too thin, either continue to cook and whisk until it thickens, or sprinkle with a dash of additional flour. SEASONING: When the sauce is finished, taste test to adjust seasonings to your preference. CREAM CHEESE: I find that it is easier and quicker to melt in the pan if its added in cubes or 1 tablespoon increments.